The people of Community Grace Church in Greencastle, Pa., needed a church building. So they prayed for one — and God answered. For the Hutchison’s, the donation of a church building was not just an answer to prayer. It was a testimony to God’s ability to provide in miraculous ways and an opportunity to share that with others. So how did it happen? The story begins with Denise’s unlikely friendship with a woman she met through Denise’s catering company. Within a matter of time, the Hutchison’s received an invitation to tour nearby St. Stephen’s church, where this woman was a member. The implication was that the St. Stephen’s congregation wanted to make a business deal involving the building. A group of about 30 members of Community Grace, including the Hutchison’s, visited the facility. At the end, they asked their hosts if they wanted to rent, lease, or sell the building. The response was surprising. Some term it miraculous. The St. Stephen’s building would be donated to the Grace Brethren group, recognizing the two shared a similar mission and it was a resource St. Stephen’s no longer could use. 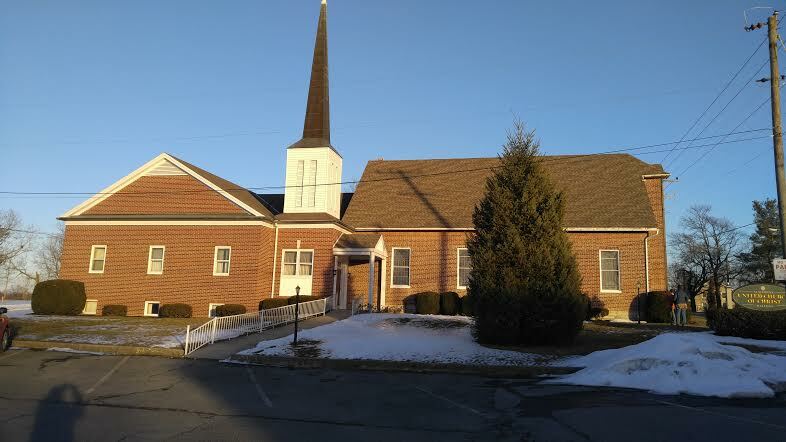 The 7,000 square foot building has plenty of space to grow; the current congregation consists of 75 members and the “new” church sanctuary can hold 250. The classroom space will allow for expansion of Sunday school classes, more community activities, and more concerts on site. Once inside, the leadership realized the previous congregation had left everything in the facility for their use, including antique silver communion trays with glass cups, Depression-ware glass vases, and a glass-encased quilt from 1857 with the signatures of the original church members. The facility is located on Buchanan Trail just four miles west of Greencastle, where Community Grace Church currently meets. It sits on one-fifth of an acre in a park-like setting. This provides the necessary room for the church hold outdoor events on-site, such as the community egg drop during the Easter season, which attracts approximately 6,000 visitors each year. The legal paperwork is expected to be completed this week, but Community Grace Church now has use of the building. Click here to send a letter of encouragement to Pastor Paul and the congregation of Community Grace Church.